Last summer, having spent a lovely weekend on Nantucket Island, we hopped the evening car and truck ferry back to Hyannis. The day had been resplendent with high clouds and brilliant blue sky and our home coming journey commenced with the setting sun. Steely and small, the ferry was our tramp steamer, outfitted with an indoor shelter and a multitude of vehicles, including the island’s garbage truck hauling its tony refuse to reside permanently on the mainland. As we left the harbor my friends and I found a suitable perch for sunset gazing in the boat’s bow. But with the sight of land lost to us, and sunset fading, they sought shelter from the chill sea air. My wrap drawn around me I was left alone, exhilarated by a rush of thoughts and plans matching the ever expanding sky. A perfect time for reflection, clear time to set a future course for myself I thought. Setting my table for reflection, I planned a feast of thought poetry as the cerulean blue above gave way to a deepening purple. But there was only the fire dying in the sky and nothing on my plate. No inspiration, insight, clarity or creation came to join my dinner party. I searched the sky pleadingly. The conditions were perfect. And then the realization arose. Insight and its retinue did not arrive ordered off a menu, even when all romantic conditions were met. I pulled my wrap a little closer and settled with that thought while darkness circled the ferry. As the chill deepened I discovered that the moon had risen off the stern, it’s illuminating beauty contrasting with our craft and its industrial cargo. It looked like a golden talisman hung on the bodice of the Yoruban sea goddess, Olokun, lighting our wake, mesmerizingly large and close. 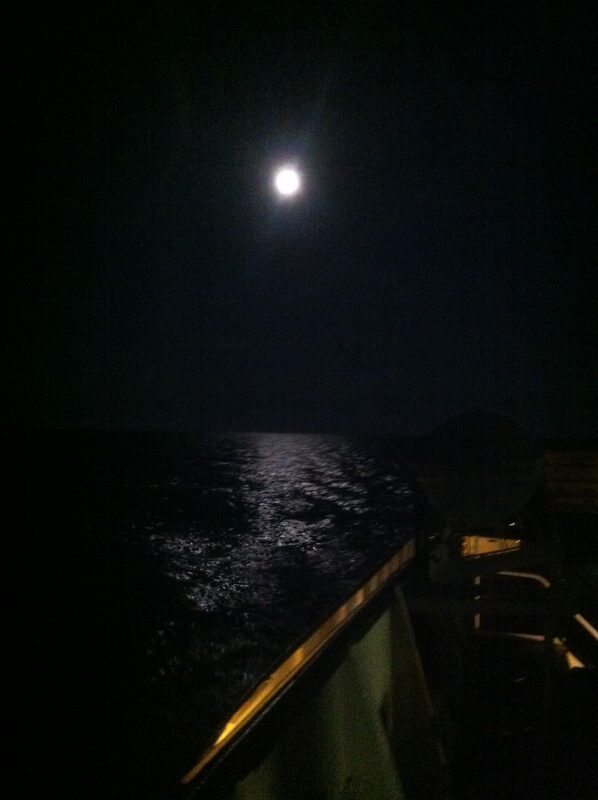 Suddenly, a powerful beam of light from the ship’s bridge shot into the inky starboard ocean. A small boat too close or a person in peril? My thoughts left me feeling uneasy. Then just as suddenly the beam disappeared. I peered into the darkness ahead, as once again the brilliant beam cut through the night in its search of the forward distance. Startled, I realized what the ship’s crew was seeking, the buoy markers directing us to safe harbor. Leaving my empty table setting, I joined the rhythm of the journey, present and in awe as the search beam stayed connected to the buoy like a held hand, with each ruby light on fire for seconds before being extinguished as the search beam moved on, keeping us on course. Proceeding in perfect dance steps, the beam moved back and forth between the buoy now known to it and a new one in the unknown darkness, one not yet seen, changing partners in a dance that had been perfected on thousands of journeys and yet must be danced anew each time. And it was now, in this dance and on this journey, that I came home, present to my experience, no longer waiting with table set and romantic notions of how insight and inspiration came ordered with the moonlight. No, it was just in the simple workings of the moment. I realized that no invitation, order or demand could satiate an illusion. Insight was available to me when I was available to dance with it. It was in the simple majestic working of the moment, being fully present to it, that I would see the wisdom in coming home to it – the buoy could always be seen, the dance danced in the knowing, and home would always be found. All I needed to do was to peer into the unknown darkness ahead.